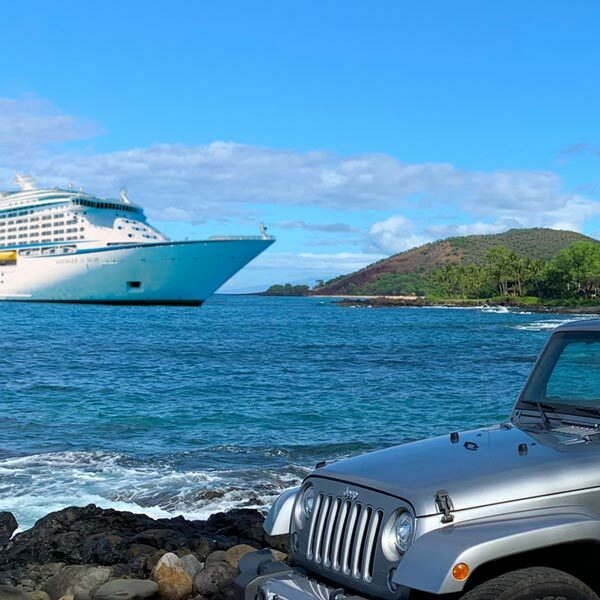 We provide discounted car rentals for cruise ship passengers at all major cruise harbors in the Hawaiian Islands. Simply select your Pier Location using our Rate Search. The detailed information found on this page is identical to the confirmation email you will receive from us when renting a car for a specific cruise ship harbor. Here are directions for the 6 rental companies we can offer discount car rental through. You will receive this information in your confirmation email if you rent a car or Jeep for your next cruise. Vehicles are stored at the Hilo (ITO) airport location. Alamo provides a free shuttle from the airport to the pier. The shuttle runs about every 20 minutes once the ship comes in until 11 am. If you need a shuttle after 11 am - please call Alamo to arrange. Ask at the counter about the last shuttle back to the pier. Crew members unloading this ship will instruct you where to catch the shuttle. Alamo Hilo (ITO) phone # 808-961-3343. If you are using Avis, located at the Hilo airport, a few miles away, Avis provides a free shuttle to and from the airport to the pier for cruise customers. Phone Avis to inquire about a shuttle. Ask any crew member on the ship where to go to get the shuttle. (double check, but the shuttle currently runs from 6:30AM-10:30AM and 2:30PM-6PM) You can also ask at the counter when picking up your vehicle about the return shuttle schedule. Avis phone # at the Hilo (ITO) airport: 808-935-1298. Renting a car at Hilo? We may book you with Budget at the Hilo (ITO) airport. They provide a free shuttle service to and from the pier for cruise ship customers. The shuttle runs continuously from 7 am to 11:30 am and the return shuttle to the pier starts at 2:30 pm. The ship's crew will be able to direct you where to go to meet the shuttle. (double check but shuttle currently runs from 6:30AM-10:30AM and 2:30PM-6PM) Check at the counter when picking up your vehicle regarding the times of the last shuttle back to the pier. Budget Hilo (ITO) phone # is 808-935-6878. The Hilo Harbor uses Dollar at the Hilo (ITO) airport location. Dollar sends free shuttles to the pier in the morning for a few hours. You can phone Dollar to check on their schedule when you disembark from the ship. Check with Dollar at the counter about return shuttle schedules. Dollar Hilo (ITO) phone # is 808-961-2101. Shuttles come from Enterprise at the Hilo (ITO) airport location. Enterprise sends free shuttles to the pier for Cruise ship customers on a continuous schedule. You can ask a crew member from the ship on disembarking where to wait for the shuttle. Ask at the counter about return shuttle schedules. Enterprise Hilo (ITO) 808-933-9683. Enterprise Rent-A-Car, Hilo International Airport 1363 Kekuanaoa St. Hilo, Hawaii 96720. Upon disembarking at the pier, board the shuttle bus. If shuttle is not there when you arrive you can call for pick up at (808) 961-2101. Dollar is located in the lobby of the King Kamehameha Hotel at the foot of the pier. When you have disembarked from the tender, just walk over to the hotel and find Dollar in the lobby. They physically close at 12 pm, so you will need to get drop off instructions from the counter when you pick up the vehicle. They will let you know where to park the vehicle and where to leave the key. Their phone # is 808-331-0531. This Enterprise is in downtown Kona. Enterprise 74-5583 LUHIA ST.KONA. Enterprise will send a free shuttle to the pier from this location. Cruise customers must call them once they are off the ship and on land and they will be instructed on where to meet the shuttle. This location is open Mon-Fri. 7:30am-6pm Sat.9am-noon and closed Sunday. phone 808-331-2509. The Alamo at the Lihue (LIH) airport location a few miles away from Nawiliwili Harbor - Alamo sends free shuttles continuously when the ships are in port. Please ask the ship's crew for directions where to stand to wait for the shuttles. Ask at the counter on arrival about the return shuttle schedule, and the last shuttle back to the pier. Alamo Lihue (LIH) 808-246-0645. Rentals are stored with Dollar Rent-a-Car at their Lihue (LIH) airport location. 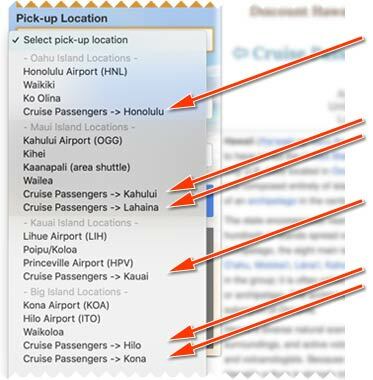 Dollar provides a free shuttle between the cruise port and their location near the Lihue Airport. Please check with Dollar when you disembark to arrange your shuttle. You can ask the ship's crew where to stand to wait for the shuttle. When picking up the vehicle, check for arrangements for catching the shuttle back to the pier, and what time the last shuttle will head to the port. Dollar's phone # is 808-245-3652 at Lihue Airport. The Enterprise at the Lihue (LIH) airport location a short distance from Nawiliwili Harbor Enterprise runs free shuttles continuously from this location. Ask about the return shuttle schedule at pick up. Customers will see the shuttle area when they get off of the ship, or ask a crew member from the ship for directions on where to stand to wait for the shuttle. Enterprise Lihue (LIH) airport phone # 808-246-0204. We rarely use Avis at their Kahului (OGG) airport location. This location serves the Kahului Harbor, but does not serve the Lahaina Harbor. Avis will send free shuttles to and from the pier for cruise ship customers. You can phone them if you do not see a shuttle. Please ask a crew member from the ship where to stand to wait for the shuttle. Please check at the counter about return shuttles to the pier. Avis Kahului (OGG) phone # is 808-871-7576. The best rates we offer are usually from Budget at the Kahului (OGG) Airport. This location serves the Kahului Harbor, but does not serve the Lahaina Harbor. They send free shuttles automatically to the pier to pick up cruise ship passengers on both days the ship is in port. You can ask the ship's crew when disembarking where to go to wait for the shuttle. Please check with Budget at the counter when you pick up the vehicle about return shuttle details, and what time their last shuttle leaves for the pier. They have a direct dial phone located at the Harbour if you need to call them, or you can dial 808-871-8811 and dial 0 to reach their counter personnel. Shuttles come from the Dollar car rental at the Kahului (OGG) Airport. This location serves the Kahului Harbor, but does not serve the Lahaina Harbor. They provide a free shuttle service to and from the port. For the first day in port, Dollar will run the free shuttle continuously from 8 am to 12 pm, and after that time, you can phone and they will send the shuttle. On day 2, you must phone them to arrange the shuttle to the car rental location. You can ask the ship's crew where to stand to meet the shuttle. Please check with the counter on arrival for instructions for vehicle returns and shuttle schedules back to the pier. Dollar's phone # at Kahului Airport is 808-877-2732. This location serves the Kahului Harbor. They provide a free shuttle service to and from the port. For the first day in port, Thrifty will run the free shuttle continuously from 8 am to 12 pm, and after that time, you can phone and they will send the shuttle from (OGG). On day 2, you must phone them to arrange the shuttle to the car rental location. You can ask the ship's crew where to stand to meet the shuttle. Please check with the counter on arrival for instructions for vehicle returns and shuttle schedules back to the pier. Thrifty's phone # at Kahului Airport is 808-877-2732. Local Avis at their Kaanapali/Kapalua (JHM) location. This location serves the Lahaina Cruise Harbor, but does not service the Kahului Cruise Harbor. Avis sends shuttles to the pier automatically, but you can phone them for pick up information. This location closes at 5pm sharp so please enquire at the counter about their return policy for late drop offs, and their shuttle service back to the pier. Avis Kapalua phone # is 808-661-4588. This location serves the Lahaina Cruise Harbor. Budget will send a shuttle to pick you up to take you to pick up the vehicle at their location. When you get on the tender, phone Budget, and they will send the shuttle. When you get off the tender, stand by the public washrooms at the end of the pier and wait for the shuttle. Budget closes at 5 pm sharp. Ask at the counter about the times for the last shuttle back to the pier, and their late drop policy. Budget (JHM) Kapalua phone # is 808-661-8721. Booked with Alamo at the Waikiki Discovery Bay location? Alamo sends free shuttles to the pier. After renting a car from us you can phone Alamo to get instructions and arrange shuttle pick up. ALAMO Waikiki Discovery Bay 808-947-6112. If you are booked with Dollar through AlohaRents in Waikiki at 2002 Kalakaua Avenue, they will provide a free shuttle to and from the Honolulu pier from this location. Designated pick up times from the Cruise Port are 8:30am and 10:00am. Complimentary Shuttle Bus service to the Cruise Port for renters is 2:00pm, 4:00pm, and 6:00pm from our Waikiki location located at 2002 Kalakaua Avenue. Please call 808-952-4264 to arrange for pick up of the rental car reservation we can provide. All vehicles returning to Waikiki must be returned to the following address: 2002 Kalakaua Avenue. A one-way drop fee will be assessed if the vehicle is returned to a different rental location other than the original pick-up location. 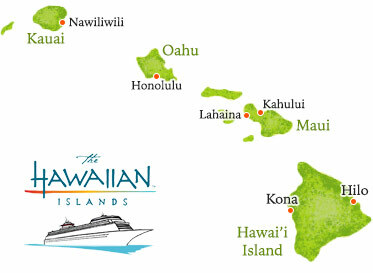 Take a Hawaii cruise and explore exotic locations spread across four islands. Departing to the Hawaiian Islands from Honolulu Hawaii, Los Angeles California, San Diego California, and Vancouver, BC. The beauty of Hawaii and the magic of the holidays combine to make this a true once-in-a-lifetime experience. When you cruise to Hawaii with Cunard, you’ll almost certainly visit the isle of Oahu, whose immense natural riches include Pali Lookout, with breathtaking views. On Kauai, stunning Waimea Canyon is the main draw, while over on Maui, you won’t want to miss the rock known as the Iao Needle. The Hawaiian Islands have long been North America's tropical playground, a volcanic archipelago in the middle of the Pacific that is the country's most surprising state. Before they became an American territory, before Captain Cook, the Hawaiian Islands were the home of a Polynesian culture whose roots still run deep. In Hawaii's floral-scented valleys and on its sandy beaches, that legacy lives on in an aloha spirit. Only Norwegian Cruise Line allows you to see four islands with two overnight stays in seven days. Capture the spirit and soul of Hawaii as you visit Oahu, Kauai, Maui and the Big Island. And since Norwegian sails round trip from Honolulu year-round, we offer Hawaii vacations on your schedule. Hawaiian Island cruises offer an intoxicating mix of island adventure and carefree cruising. Discover why the Travel Channel named them "Best Cruises to see Hawaii." As we all know, Hawaii is a group of islands with hundreds of beaches. Do you cruise to Oahu and hit Waikiki — where the people-watching is as good as the tanning — or to the scenic Napali Coast of underrated Kauai? Decisions, decisions.